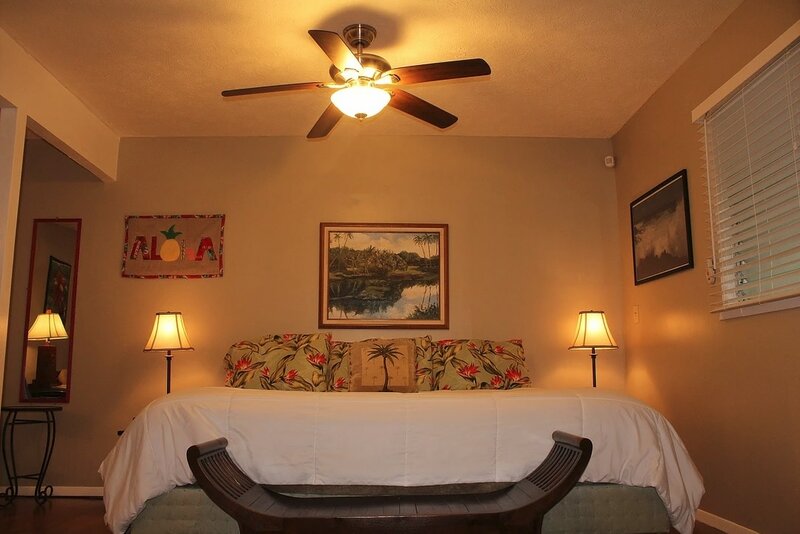 Spend your vacation on the southern end of the Big Island of Hawaii in this peaceful one bedroom one bathroom bed and breakfast. We serve a complete hot breakfast every morning. You have access to a complete open air kitchen and dining on the lanai. We are located about halfway between Kailua Kona and Hilo, so getting around the island is easy. Kula Kai Caverns is about three minutes away. South Point is 24 miles from here. Punaluu Bakery and Punaluuu Black Sand Beach are on the way to Volcanoes National Park. It is about an hour's drive to the entrance of the park. There is hiking all around and beach access can be from extremely easy to needing a 4 wheel drive vehicle. We will be happy to suggest activities that stay within your budget to help make your vacation very memorable.